What It’s About: Texas millionaire Joe Grant (Ralph Bellamy) hires a group of mercenaries to rescue his wife Maria (Claudia Cardinale) from the hands of bandit Jesus Raza (Jack Palance), who is holding her in Mexico. 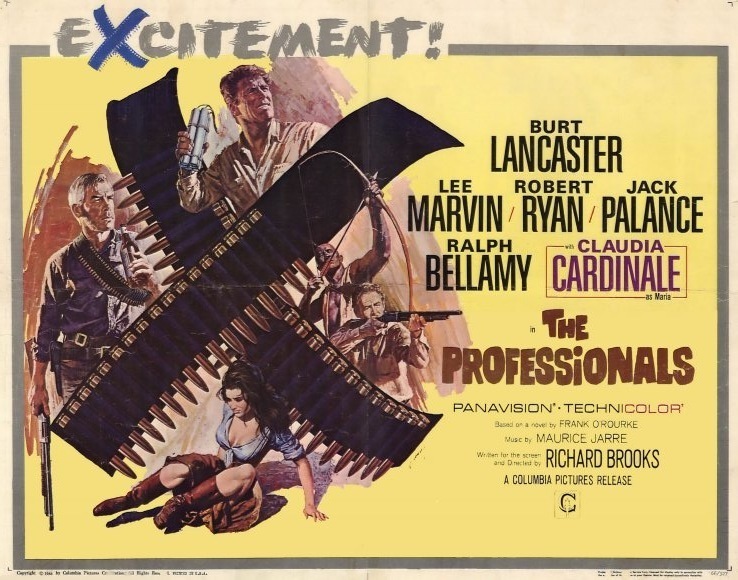 Each man is an expert, the top “professional” in his field: weapons master and former Pancho Villa advisor Rico Fardan (Lee Marvin), wrangler Hans Ehrengard (Robert Ryan), tracker Jake Sharp (Woody Strode), and demolitions man Bill Dolworth (Burt Lancaster). Grant tells the men that he’d rather pay them $40,000 and be sure of getting Maria back than pay Jesus’s $100,000 ransom. Can the “Professionals” learn to work together and rescue Maria against enormous odds? Is there more to the situation than Grant is letting on? This entry was posted in Adaptation, Adventure, Based on a Book, Movie of the Day, Revisionist Western, Western and tagged banditos, bandits, Best Adapted Screenplay Nominee, Best Cinematography Nominee, Best Director Nominee, Burt Lancaster, Claudia Cardinale, Columbia Pictures, Conrad L. Hall, double cross, explosives, Hispanic-face, hostage, Jack Palance, kidnapping, Lee Marvin, Maurice Jarre, mercenary, Mexico, Pancho Villa, Ralph Bellamy, ransom, Robert Ryan, Texas, trackers, train, veteran, Woody Strode.